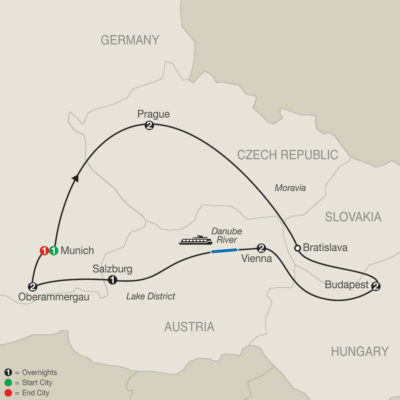 This Central Europe tour is a magnificent journey through the former Habsburg Empire. Your tour starts and ends in Munich. Along the way, you’ll overnight in some of Central Europe’s most exciting cities: Prague, Budapest, Vienna, Salzburg, and Oberammergau. Spectacular scenery also awaits you on this Central Europe vacation. You’ll drive through the lovely Salzkammergut Lakeland to picturesque Salzburg. Additionally, you’ll enjoy a leisurely Danube cruise along the most scenic section of the river. During your cruise, enjoy Kaffee und Kuchen (coffee and cake). This special experience—along with a visit to Munich’s famous Hofbräuhaus (its best known beer hall dating back to 1589)—is included by Globus to ensure your vacation is unique. In the charming village of Oberammergau, Globus has provided you with first-class seats to the world-famous Passion Play, performed every 10 years by Oberammergau residents. 11 nights in deluxe hotels, close to city centers. Full buffet breakfast daily, one lunch in Oberammergau, and seven three-course dinners with wine. Boat cruise on Danube River.